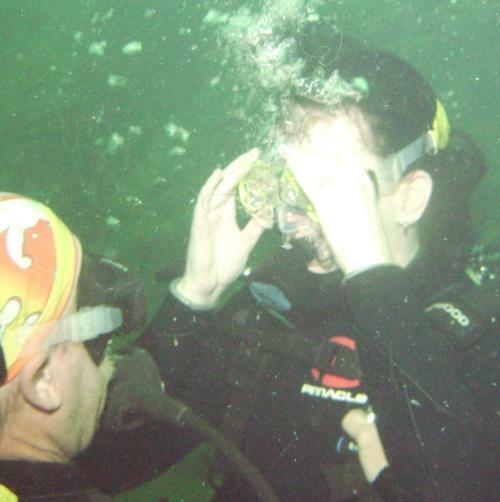 Since I am so addicted to scuba diving and want to go dive every weekend, I started a PADI Divermaster certification back in June to help on the various dive trips with Sterling Silver Scuba, a local dive shop with a great bunch of divers and staff. I had a quick start; I managed to do all my knowledge reviews during the first week. Second week, I went for various skill assessments. Then I started a series of pool and open water insternships and was done by mid-July. However, I felt that I was not ready. I continued helping with logistics, AOW and certified divers (guided tours) for the remaining of the summer trips, and finally decided to take my final exams last week. I did the 8 theory exams this week and completed the DM application yesterday (Sat 9/13). For many, the natural progression after DM is to become an AI or go straight to the IDC. Personally, I am not interested in teaching OW. I’m interested in diving for fun and I enjoy teaching theory class. 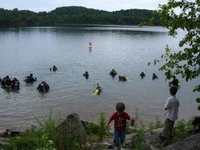 I have fun organizing dive trips, guided tours and assisting with students at an advanced stage. I’m also happy working one-on-one with other divers on skills such as efficient kicking, buoyancy or assisting with equipment configuration, etc. However, at the moment, I am not interested in leading pool and open water sessions, evaluating skills, etc. Maybe I’m not ready or simply selfish and more interested in advancing my own diving skills. Kevin, Thank you for your time, patience and mentorship. Congrats to Vee who successfully did her gear exchange demo. I just wanted to express my congratulations! From the very beginning I have been impressed with your enthusiam and I have to admit to wanting to following your example whenever/where-ever possible. Have a great time on your new Cave Class & Cert! Want to get more certification in Taiwan? Forget it!